With its traditional mission styling, this desk is sure to add a welcoming atmosphere in your home office or living room. Stylish and functional, this desk features a middle pullout drawer for a keyboard. Use the expanse of desk surface to complete daily tasks and add the matching swivel arm chair for a truly unified solution to your home office needs. The Cross Island Small Leg Desk with Keyboard Drawer by Ashley Furniture at AHFA in the area. Product availability may vary. Contact us for the most current availability on this product. Wire Management Internet port and electrical outlet is available in the Modular Desk. The richly detailed mission design of the "Cross Island" collection features furnishings for your living room, home office, and entertainment spaces. Capturing the beauty of rich country style with a versatility that enhances any home decor, a medium brown oak stained finish is beautifully accented by the mortise through ornamentation to create the rustic beauty of finely crafted mission styled furniture. 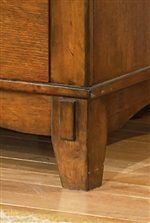 Design features such as thick posts, raised panel details, overlay slats and blocks ornamentation, spindle backs and sides, tapered feet and legs, cast mission ball handles in a dark patina finish, and cast hardware finished in an aged bronze color are seen throughout this versatile collection. Functional as well stylish, ample storage is offered in the form of shelves, drawers, and doors to fulfill your storage needs. Bring "Cross Island" home with you to achieve a rich and illuminating country atmosphere where relaxation is a guarantee. The Cross Island collection is a great option if you are looking for Mission furniture in the area. Browse other items in the Cross Island collection from AHFA in the area.